Another topic that came to mind for the #fp2012 theme of Beginnings was the first town hall in Hawthorn. Most people, familiar with the 1888 Beswicke designed building, don't ponder where the Council offices were before. The municipality of Hawthorn came into existence in 1860 when a petition of residents successfully called for separation from the Boroondara Roads Board. 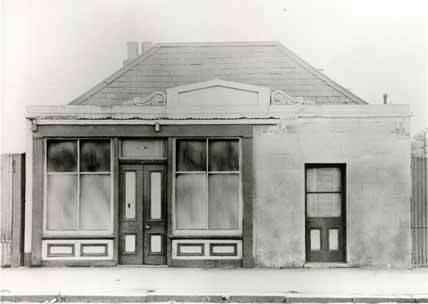 The Boroondara Roads Board met in a room attached to a shop on the north side of Burwood Road just east of Power Street, Hawthorn. And it was there on 26 July 1860 that the first public library opened in the area. The Boroondara Roads Board continued to meet there until 1861 but the new municipality wanted a permanent building which reflected its status. After much debate about the most desirable location for this edifice, eventually a block of land in the current Burwood Road next to Fletcher's Hotel was sold to the fledgling Council for offices which would incorporate municipal and police buildings as well as the courthouse. The photograph at the head of the post shows the 1862 Hawthorn Town Hall built on the current location in Burwood Road and officially opened in February of that year. The extension to the east including the library and the tower were completed later in the year. The library then moved east to this location. The 1862 Town Hall was demolished in 1888 to make way for a new town hall more worthy of the municipality of Hawthorn which was declared a Town in 1887. 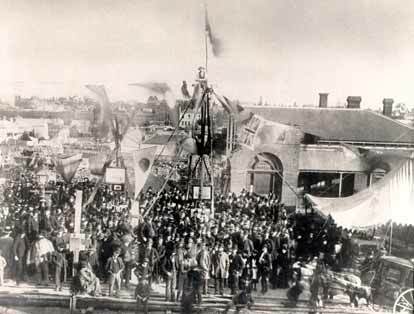 The photo below shows the predominantly male gathering at the laying of the foundation stone for the new Town Hall on 7 August 1888. In this photo the partially demolished 1862 town hall can be seen.